AMD is set to have something great for entry-level computer buyers with the launch of their Pisces platform from Taiwan. Pisces is said to incorporate AMD�s Athlon II processors ; Propus, Rana and Regor – and a new 55nm-based 780G+ IGP chipset, together with the ATI Radeon HD 4200 GPU. That 780G+ chipset is set to go into design validation this month, according to the sources. Motherboards using the design will then be showcased at Computex Taipei 2009 in June; AMD has only committed to launching Pisces in the second-half of 2009, as part of the AMD Live! range. While Pisces is an entry-level solution, it�s nonetheless expected to support above-1080p resolutions, 7.1-channel surround sound and 3D visuals. Considering the vast array of desktop options that techies are looking for in the market today, this new AMD technology is a great desktop alternate for the usual Intel processors that everyone prefers. For sure though, price will vary and chances are this is a great desktop that start-up technology investing people should really consider getting especially during the hard times we are in right now. While the launch is leaving everyone clueless on when to make further reviews and decisions, once this platform hits the market, expect a fair share of demands for it. AMD has proven it can stand in line with Intel based processors and apparently this is one desktop platform people will be looking out for. Here is a new release from Polywell Computers. It borders along the lines of being a gaming to a standard PC. The Poly i750SLI makes use of this technology to put in two GeForce 9500 GT graphics cards. The problem here is that the two graphics cards aren’t really any better than a single GeForce 9800 series card. Gamers would be better served by switching it to a single card configuration to so they can upgrade to a second card at a later time for additional performance. Powering the Poly i750SLI is an Intel Core 2 Duo E8500 processors. This is a good and fast processor that works well for those who do not multitask or use multithreaded apps. That is fine for gaming, but since the system isn’t the best suited towards gaming, the system probably would be better off with a quad core processor. At least the system comes with 4GB of DDR2 memory to let it run smoothly. Regardless, it looks like a powerful desktop alternative that PC desktop users are bound to consider. Containing most of the basic components that a new computer buyer would want, it looks like a lot of bonuses (depending on the actual intent of the PC buyer) will come in handy and flexible. Dell is not solely focusing on the notebook business as it unveils its Dell Optiplex 160 Desktop. Desktops are not yet pass� and branded ones such as the one being catered by Dell are sure to be still in demand. And with that notion, Dell aims to deliver powerful packages as preferred by desktop users today. These days, $500 to $1,500 will net you a desktop with a dual-core CPU and enough power to run productivity apps, view and edit vacation photos, manage MP3s and videos, and even play many of today’s games, the core activities most common to families, students, and the general purpose PC user. At $1,000 and up, you should easily be able to perform those tasks. Spend around $500, and in most cases you’ll still be able to run common tasks without delay, although 3D gaming becomes a stretch. You will definitely find a dual-core chip in a $500 desktop but Microsoft Vista could still give you trouble. 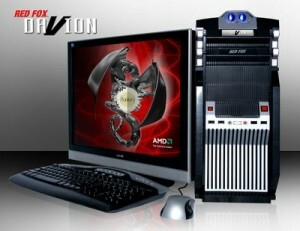 Be sure the PC is equipped with at least 1GB of memory, and it’s a good bet that you’ll be able to smoothly run Vista. Add in a 128MB graphics card, and you’ll get the Aero effects with little to no performance loss. So with those facts and figures, you do the math. Surely, notebooks do cost much, but invest that amount in a wiser desktop and you get a more powerful desktop solution in one. 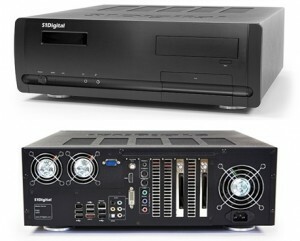 S1 Digital has reportedly unveiled a tempting new desktop solution, the P5 Media Center which boasts of a custom designed, living room friendly chassis with silent headpipe cooling technology. If you think that is neat, wait until you find out what is inside. The P500 can be equipped with up to 4 CableCARD HDTV or 2 ATSC/QAM and NTSC tuners. Standard you�ll get 3TB of RAID-5 storage, a Blu-ray drive (profile 2.0), Gigabit Ethernet, 4GB of memory, a Intel E8500 Core 2 Duo 3.0Ghz processor, ATI All-In-Wonder 3650 (with HDMI / DVI / Component / VGA video outputs), and a slick Logitech DiNovo Mini bluetooth keyboard / media center remote. With all that power under the hood, S1Digital says the P500 is capable of supporting �up to three zones of audio and video streaming (via Extenders or other Media Centers).� Starting Price: $5,999. Now that is quite a piece of machinery for a reasonable price made for multimedia freaks looking for a reliable desktop solution. As if that wasn�t enough, S1Digital�s close partnership with Autonomic Controls enables S1Digital�s Media Centers and Servers to be controlled via Crestron, AMX, RTI, HAI and PC based touchscreens over IP or RS232, including full two way feedback. One thing about PC cases these days, they come in different designs and forms. And without hesitating, the Lian-Li PC888 is a case that is one of a kind. Through the years when you buy a computer, you are normally given an option, a standard default casing or something classy and different. The difference aside from price? Normally it is just the design and perhaps the power supply that comes with it. Slots and overall design is included as well but does it really matter? The Lian-Li PC-888 is one crazy-looking computer case. 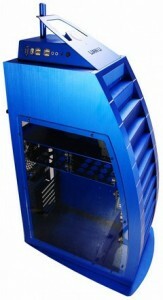 It’s constructed from blue anodized aluminum, and the case is huge, fitting in a silly amount of components. And for that size and style, you’ll pay dearly, with the price rumored to be over $400. If a unique PC design can improve computer performance, then why not? But if it is only to be fashionable, would it not be better to invest those extra amounts into something more worthy like additional memory chips or a reliable motherboard? This is something that I would not really understand. Why the preference in modern casing when performance is practically the same? Well, considering the crisis we are in today and the need to buy wisely, sacrificing a PC casing in lieu of better performance or for added savings seems to be the better option. It doesn�t make any difference anyway. Now along with higher specs comes with higher prices. 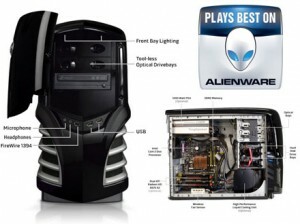 The Gamer Extreme XI has been priced at a hefty $4,939 and carries a three year warranty. To the avid gamer, it may be too much but idealistically, if you want something with promise these days, you have to really spend. Some would turn to upgrading by part, but if you sum it all up in the end, you will be surprised at the total price which may even go over the suggested retail price of gaming PCs sold in bundles. So why go through the trouble if you can get it all in one package. The gaming world is growing and so are the requirements. If you really want to enjoy trouble free gaming, look no further. The Gaming Extreme XI is there for you to own. Read the news and you will see a couple of new desktops in the market. Particularly in focus are the slimmer models from Dell which promise to be great space savers and are sure to compact the usual peripherals, much of which we see when we try and open our CPU. One has to wonder why old desktops need such space when in fact you can compress it by as much as 50% if you think about it. Some point to ventilation or perhaps provisions for added parts that may be needed. But look a bit closely, unless you are a techie geek, chances are you will make do with what your CPU has to offer. There is no sense in pushing it if you don’t have the proper space for it. One thing that these new slim line CPU’s carry though is cost and price. For sure they are going to cost mainly because they are in fashion and the fact that some of their inner components are specialized in nature, compressed as well and made from delicate technology manufacturers. But the fact remains, will the demand for these slim lines be sufficient enough to justify the cost in manufacturing them? Perhaps! But you also have to consider demand. The number of techie people are indeed plenty but they are also wise buyers. They are not bound to bite instantly. For sure, they are aware that prices decline in time and during that period, that is perhaps the only time we can see the actual demand for these slimmer and modern PCs. If you talk about speeding up your computer, there is more to pointing at the usual memory and chips that you have. Neither can you blame improper defragmentation which are normally recommended if you want your computer to perform better so that you can enjoy the speedier processes of running applications or even surfing the web. But perhaps there is one problem that has become the bane of all and it has to do with creating too much applications on your desktop that were made due shortcuts for easier navigation. Indeed, having a shortcut icon or widget on your desktop is easier rather than going to the start menu but also remember that your desktop load has a bearing when you want to speed up things for your PC. Other than being organized, why would you want to have plenty shortcut icons on your desktop when in fact an additional process doesn’t really take much effort? It is hard to classify this as a form of being lazy. But the fact that most people want to make life easier is really something that has to be acknowledged. The common understanding that computers should make life easier is at times taken on a different note meaning that some people just want to click and go to the application or website without any worries at all. If this were the case, then perhaps people should not complain that much once they find some slow processes. Overloading your desktop with shortcut icons or widgets is one of those reasons.